Once you hear their stories, it’s hard to forget. As a physiotherapist at CVT, I work with survivors of torture. These clients want to help reduce their pain and increase their mobility, but because of everything they have survived, it’s complicated. As much as we physios like to think that pain is physical, it’s both physical and mental. So here at CVT Nairobi, I work hand in hand with the psychotherapists. We hear the stories. We know that there are many cases where the perpetrators told our clients, “You’ll never get better. When you feel this pain, you will think of me.” This can have a deep effect on survivors. So we work to change their mindset. One of the ways we do this is we coordinate our physio work with the psychotherapists’ work. During the physiotherapy initial intake assessment I either interact with clients who have finished the counseling group or clients who are undergoing physiotherapy and counseling session simultaneously. 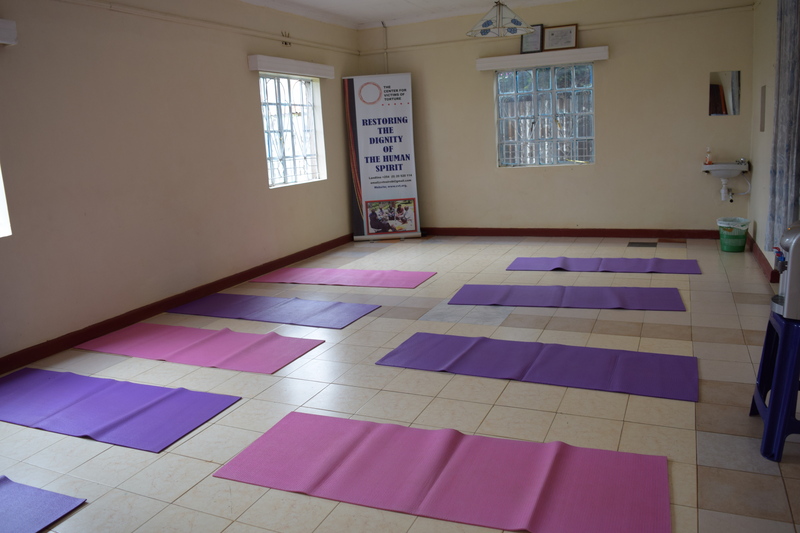 My experience is that the clients who have finished counseling have better coping skills and outlook on their physical condition and functional ability in comparison to those who are yet to complete the counseling. I see that clients who have already been through counseling are more stable. For example, after counseling, they don’t focus solely on the pain. Instead, a client may say “I have a headache, but now I’m managing it better.” Some clients may also mention “My sleep is better, and I don’t get nightmares like I used to before counseling.” At first, they have a lot of hopelessness. After counseling, they have hope. This shows me how counseling and physiotherapy go hand in hand – you can’t separate them. Before I came to CVT, I worked as a physiotherapist in private and government hospitals. I worked with outpatient and inpatient cases (adult and pediatric cases). I was interested in moving to CVT because I could see the organization was trying to help people have a better life. I was touched by what CVT is doing – the mission drew me in. I want to contribute to the greater good using what I have. We work with groups of survivors over the course of a 10-week cycle. We do breathing and relaxation exercises in all these sessions, and in many we focus on education. We educate about changes in the body after trauma and about pain. To do this, we talk about their beliefs about pain, how they think about it, what they focus on. We educate clients about acute pain and chronic pain. An important message for clients is that pain can be reduced if you change your outlook. From the very beginning of their work with us, I pay attention to their outlook on pain. Telling them that they can change their pain if they change the way they think about it is a major step. You demystify these steps. Initially, it’s hard for clients to believe us, so we are very interactive in our sessions. I work to ensure clients know through action and results that we’re not just telling them, Yes pain will reduce, yes you can increase your functionality, yes you will get better. Instead, they will experience the difference. We empathize with clients. In many cases, clients tell us they don’t know what to do with pain. All have sleeping problems. I let them talk, try to get their story. Until I listen to them, I don’t know what they feel. Some clients have lived with pain for years. I know that in only 10 weeks of sessions, we won’t clear it, but we empower them to deal with pain better. Many are on pain medication, so I point out that they have other options: they can also do exercises, or use a tennis ball to massage themselves, or they can lift things in different ways. When we give clients the information, we empower them for a lifetime. So much of my work is rewarding as clients make changes. However, parts of the job make me angry. After the group sessions, we did a three-month follow-up, and all was very good. But at her six-month follow-up, she said she had been assaulted by a man who lived near her. This client had a child, and this neighbor beat her child. When the woman confronted him, he beat her, too. He strangled her. She was in a lot of pain, especially her neck. This made me feel angry, as I knew how much progress she had made recovering from her previous injuries. She had been doing so well, but now she had pain and stress once again. I discussed this case with my supervisor, which helped. She guided me, reminded me that the client’s resilience is our focus. I saw that this client was more resilient in dealing with this crisis; she was calm when telling me about what happened. She took the steps to report the incident to the police. So I kept the focus on the client’s resilience. Some stories make me happy. Others make me very sad. When I see clients getting better, I see hope. When clients come in at intake, they are not sleeping; they’re guarded. Then they begin to trust you. I watch them in the groups; I can see pain on their faces, hear it in their breathing. So I keep reminding them, “Don’t hurt yourself.” I try not to let them feel pain, but it’s important to allow clients to make their own decisions – they decide how far to go. We assume that we will see them again – our doors are open. They are always welcome at CVT. They don’t have to wait for their follow up sessions if they have pain or a new issue. Clients really appreciate that. They say CVT respects them, that we let them know they’re valued. I’ve seen it work wonders.